As usual these are my thoughts, observations and musings not those of my employer. Scientific publishing has in many ways remained largely unchanged since 1665. Scientific discoveries are still published in journal articles where the article is a review, a piece of metadata if you will, of the scientists’ research. This is of course not all bad. For example, I think it is fair to say that this approach has played a part in creating the modern world. The scientific project has helped us understand the universe, helped eradicate diseases, helped decreased child mortality and helped free us from the drudgery of mere survival. The process of publishing peer reviewed articles is the primary means of disseminating this human knowledge and as such has been, and remains, central to the scientific project. And if I am being honest nor is it entirely fair, to claim that things haven’t changed in all those years – clearly they have. Recently new technologies, notably the Web, have made it easier to publish and disseminate those articles, which in turn has lead to changes in the associated business models of publishers e.g. Open Access publications. However, it seems to me that scientific publishers and the scientific community at large has yet to fully utilize the strengths of the Web. Content is distributed over http but what is distributed is still, in essence, a print journal over the Web. Little has changed since 1665 – the primary objects, the things a SMT STM publisher publishes remain the article, issue and journal. The power of the Web is its ability to share information via URIs and more specifically its ability to globally distribute a wide range of documents and media types (from text to video to raw data and software (as source code or as binaries)). The second and possibly more powerful aspect of the Web is its ability to allow people to recombine information, to make assertions and statements about things in the world and information on the Web. These assertions can create new knowledge and aid discoverability of information. This is not to say that there shouldn’t be research articles and journals – both provide value – for example journals provides a useful point of aggregation and quality assurance to the author and reader. The article is an immutable summary of the researchers work at a given date and, of course, the paper remains the primary means of communication between scientists. However, the Web provides mechanisms to greatly enhance the article, to make it more discoverable and allow it to place it into a wider context. In addition to the published article STM publishers already publish supporting information in the form of ‘supplementary information’ unfortunately this is often little more than a PDF document. However, it is also not clear (to me at least) if the article is the right location for some of this material – it appears to me that a more useful approach is that of the ‘Research Object’ [pdf], semantically rich aggregations of resources, as proposed by the Force11 community. It seems to me that the notion of a Research Object as the primary published object is a powerful one. One that might make research more useful. What is a Research Object? Links to other research (both historical i.e. bibliographic information but also research that has occurred since publication). Furthermore, the relationship between the different entities within a Research Object should be explicit. It is not enough to treat a Research Object as a bag of stuff, there should be stated and explicit relationship between the resources held within a Research Object. For example, the relationship between the research and the funding organization should be defined via a vocabulary (e.g. funded_by), likewise any raw data should be identified as such and where appropriate linked to the relevant figures within a paper. The major components of a Research Object. It is important to note that while the Research Object is open access the resources it contains may or may not be. For example, the raw data might be open whereas the article might not. People would therefore be able to reference the Research Object, point to it on the Web, discuss it and make assertions about it. In the FRBR world a Research Object would be a Work i.e. a “distinct intellectual creation”. The current publishing paradigm places seriously limitations on the discoverability of research articles (or research objects). Scientists work with others to research a domain of knowledge; in some respects therefore research articles are metadata about the universe (or at least the experiment). They are assertions, made by a group of people, about a particular thing based on their research and the data gathered. It would therefore be helpful if scientists could discover prior research along these lines of enquiry. Implicit in the above description of a Research Object is the need to publish URIs about: people, organisations (universities, research labs, funding bodies etc.) and areas of research. Such a graph would help readers to both ‘follow their nose’ to discover research and provide meaningful landing pages for search. One of the significant benefits a journal brings to its readership is the role of curation. The editors of the journal selects and publishes the best research for their readers. On the Web there is no reason this role couldn’t be extended beyond the editor to the users and readers of a site. Different readers will have different motivations for doing so but providing a mechanism for those users to aggregate and annotate research objects provides a new and potentially powerful mechanism by which scientific discoveries could be surfaced. For example, a lecturer might curate a collection of papers for an undergraduate class on genomics, combining research objects with their own comments, video and links to other content across the web. This collection could then be shared and used more widely with other lecturers. Alternatively a research lab might curate a collection of papers relevant to their area of research but choose to keep it private. Such metrics could be used directly e.g. research indexes or; indirectly e.g. to help readers find the best/ most relevant content. Finally it is worth remembering that in all cases this information should be available for both humans and machines to consume and process. In other words this information should be available in structured, machine readable formats. 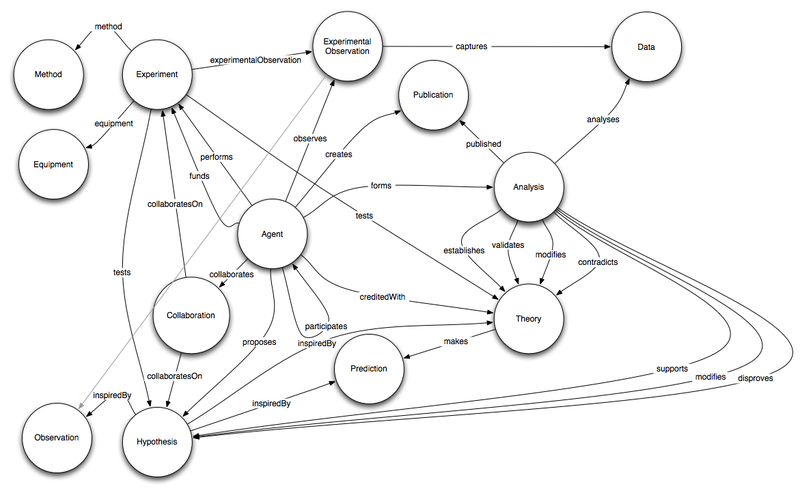 Paul, Michael and Silver have done a bit more work refining the nascent science ontology — unfortunately I was caught up doing something a lot less interesting so this version is all their work and not mine, and it is all the better for it. The big change to this version is the removal of much of the publication specific stuff since this is handled elsewhere otherwise otherwise it should look like a fairly obvious evolution from the previous versions. And here’s a N3 serialisation of the model. There’s still lots to do, it needs checking against what happens when there are multiple ranges are given for a property, we need to write proper definitions, add namespaces, look for existing ontology reuse etc. rdfs:comment "Definition goes here" . So this is the question: do you always need separate URIs for non-information resources and the information resource? That is do you need an identifier for both the document and the thing the document is about? Your answer to that question will depend a lot on your attitudes to the semantic web project. Now until recently I would have said “yes you do need both”, but recently I’ve been thinking that perhaps it’s not quite so black and white. Before I get into why I think it probably makes sense to backtrack a little and explain the background to the question. After all for many people this question seems odd: why on earth would you need a URI for anything other than the web page, the document? In the real world we give all sorts of things identifiers: people have passports and National Insurance Numbers; buildings get Post Codes; books ISBNs etc. We do this because it’s useful to be able to unambiguously identify stuff. To be able to point, discuss and share information about things. On the Internet we have email addresses and URIs on the Web. OpenID for example is predicated on the notion that a person can have an URI to identify themselves. And the Linked Data project gives URIs for not just people, but all sorts of things: people, places, animals, music, and through dbpedia the myriad of things described in Wikipedia. Once you have an identifier for a thing you can make assertions about that thing. How big it is, where it is (in the real world), when it was created, who owns it, anything. You can also describe how those things relate to other things – this person is friends with this person and works for this company, which is at this address etc. Now many people will tell you (indeed I probably will too) that you need to distinguish the statements you make about the thing in the real world from the statements about the document. For example, a URI for me might return a document with some information about me, but the creation date for that document and the creation date for me are two different things. And because you don’t want to get confused it’s better to have a URI for the thing and another one for the document making assertions about the thing. Make sense? For those that are interested there are a couple of different ways of achieving this separation. For the purposes of this post it’s not important to know how to do this, but if you’re interested have a look at this paper by Richard. But here’s the thing, many people will tell you that this is all too complex and frankly unnecessary, indeed you may well be thinking the same thing right about now. Some people will tell you that the whole non-information resource thing isn’t necessary – we have a web of documents and we just don’t need to worry about URIs for non-information resources; others will claim that everything is a thing and so every URL is, in effect, a non-information resource. Michael, however, recently made a very good point (as usual): all the interesting assertions are about real world things not documents. The only metadata, the only assertions people talk about when it comes to documents are relatively boring: author, publication date, copyright details etc. If this is the case then perhaps we should focus on using RDF to describe real world things, and not the documents about those things. On the Web there are a number of different ways of making an assertion about a thing (as identified via a URI): you can state how it relates to other things, you can link it to a piece of data (e.g. RDF literals) or you can link it to a document which makes some statements about the thing (e.g. a news article). The question is: is there much utility in defining non-information resources in this third scenario: do you need URIs for the documents? Obviously they still need a URL so you can link to it and you should make that document available in a variety of representations but do you need a separate identifier for the non-information resource? This is how I’ve started to think about it: RDF is a great way of describing how (real world) things relate to each other and for this you need URIs for non-information resources. And because you’re dealing with real world things (I know documents are real world things too, but going down this path is how we ended up with the confusion we have today) you will hopefully have interesting and useful links to other things, useful chunks of data and links to useful documents about that thing. Those documents could be in any format – they could be an HTML document, a (Flash) movie, MP3 file, even a csv file. 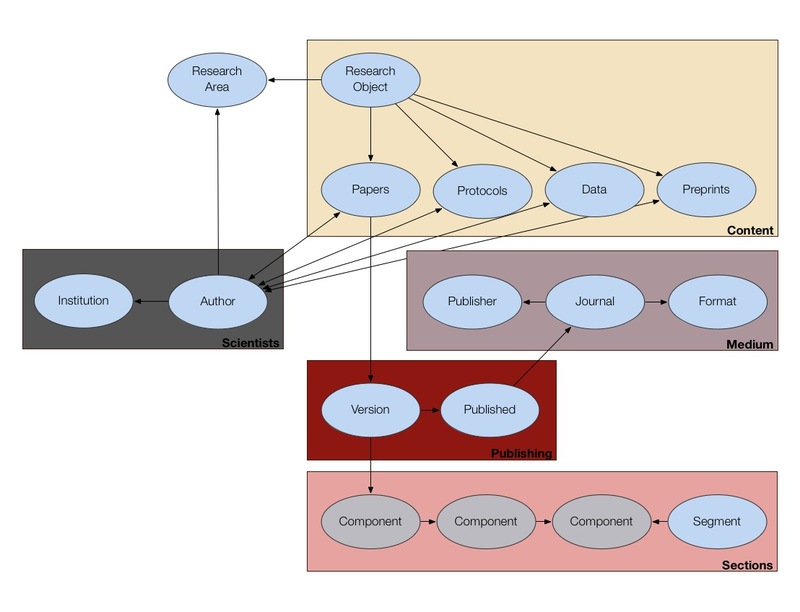 The point is the documents decorate the tree they are discoverable via the RDF graph but they don’t need to be published as RDF themselves. An RDF graph of things is therefore a great way to: discover documents, to make assertions and share what we know about how those things. Or put another way RDF is a way of building a vocabulary to describe how web resources related to real world objects. I my however me wrong and I would be interested to hear what others think. By a mile the highlight of last week or so was the 2nd Linked Data meet-up. Silver and Georgi did a great job of organising the day and I came away with a real sense that not only are we on the cusp of seeing a lot of data on the web but also that the UK is at the centre of this particular revolution. All very exciting. I also joined Paul Miller, Jeni Tennison, Ian Davis and Timo Hannay on a panel session discussing Linked Data in the enterprise. If you’re interested in the RDF and how we’re modelling the data we’ve documented the wildlife ontology here. In addition to the ontology itself we’ve also included some background on why we modelled the information in the way we have. If you want to get you’re hands on the RDF/XML then either add .rdf to the end of most of our URLs (more on this later) or configure your client to request RDF/XML – we’ve implemented content negotiation so you’ll just get the data. But… we’ve not implemented everything just yet. Specifically the adaptations aren’t published as RDF – this is because we’re making a few changes to the structure of this information and I didn’t want to publish the data and then change it. Nor have we published information on the species conservation status that’s simply because we’ve not finish yet (sorry). It’s not all RDF – we are also marking-up our taxa pages with the species microformat which gives more structure to the common and scientific names. Anyway I hope you find this useful. I’ve really been neglecting this blog recently – apologies but my attention has been elsewhere recently. Anyway, while I get round to actually writing something here’s a presentation I gave at the Online Information Conference recently. The presentation is largely based upon the article Michael and I wrote for Nodalities this time last year. As a child I loved Lego. I could let my imagination run riot, design and build cars, space stations, castles and airplanes. My brother didn’t like Lego, instead preferring to play with Action Men and toy cars. These sorts of toys did nothing for me, and from the perspective of an adult I can understand why. I couldn’t modify them, I couldn’t create anything new. Perhaps I didn’t have a good enough imagination because I needed to make my ideas real. I wanted to build things, I still do. Then the most exciting thing happened. My dad bought a BBC micro. Obviously computers such as the BBC Micro were in many, many ways different from today’s Macs and if you must PCs. Obviously they were several orders of magnitude less powerful than today’s computers but, and importantly, they were designed to be programmed by the user, you were encouraged to do so. It was expected that that’s what you would do. So from a certain perspective they were more powerful. BBC Micro’s didn’t come preloaded with word processors, spreadsheets and graphics editors and they certainly weren’t WIMPs. What they did come with was BBC BASIC and Assembly Language. They also came with two thick manuals. One telling you how to set the computer up; the other how to programme it. This was all very exciting, I suddenly had something with which I could build incredibly complex things. I could, in theory at least, build something that was more complex than the planes, spaceships and cars which I modelled with Lego a few years before. Like so many children of my age I cut my computing teeth on the BBC Micro. Learnt to programme computers, and played a lot of games! Unfortunately all was not well. You see I wasn’t very good at programming my BBC micro. I could never actually build the things I had pictured in my mind’s eye, I just wasn’t talented enough. You see Lego hit a sweet spot which those early computers on the one hand and Action Man on the other missed. What Lego provided was reusable bits. When Christmas or my birthdays came around I would start off by building everything suggested by the sets I was given. But I would then dismantle the models and reuse those bricks to build something new, whatever was in my head. By reusing bricks from lots of different sets I could build different models. The more sets I got given, the more things I could build. Action men simply didn’t offer any of those opportunities, I couldn’t create anything new. Early computers where certainly very capable of providing a creative platform; but they lacked the reusable bricks, it was more like being given an infinite supply of clay. And clay is harder to reuse than bricks. Today, with the online world we are in a similar place but with digital bits and bytes rather than moulded plastic bits and bricks. The Web allows people to create their own stories – it allows people to follow their nose to create threads through the information about the things that interest them, commenting, and discussing it on the way. But the Web also allows developers to reuse previously published information within new, different context to tell new stories. But only if we build it right. Most Lego bricks are designed to allow you to stick one brick to another. But not all bricks can be stuck to all others. Some can only be put at the top – these are the tiles and pointy bricks to build your spires, turrets and roofs. These bricks are important, but they can only be used at the end because you can’t build on top of them. The same is true of the Web – we need to start by building the reusable bits, then the walls and only then the towers and spires and twiddly bits. But this can be difficult – the shinny towers are seductive and the draw to start with the shiny towers can be strong; only to find out that you then need to knock it down and start again when you want to reuse the bits inside. We often don’t give ourselves the best opportunity to womble with what we’ve got – to reuse what others make, to reuse what we make ourselves. Or to let others outside our organisations build with our stuff. If you want to take these opportunities then publish your data the webby way. On the web I reckon there’s only metadata and URIs or perhaps there’s no metadata and only data. Either way the metadata, data/content distinction isn’t helpful. Linked Data allows you to bind HTTP URIs to an object and to information about that object. This is useful because it’s more useful to talk about real world things — things like people, places and events — the things that people think about. Despite this I have numerous conversations, and have done for years, about what ‘metadata’ to use to describe a document. Typically what this really means is: “what keywords to use so that some technomagical solution can use that ‘metadata’ to personalise/ recommend content”. Beyond the obvious — keywords on their own are never going to achieve the sorts of solutions non-technical people imagine — it also forces an unhelpful schism. It makes people think about their content and your metadata, or that metadata is somehow outwith the content they are creating. The trouble is that one persons data is another persons metadata. Is the title of a story metadata or content? Is a news story content or metadata about a real world event? The answer depends on your perspective. It seems to be that a more useful way to think about things is to have URIs to identify things and then have information/documents/data/metadata/whatever that make assertions about those things. Sometimes those bits of information will be simple data points, for example, for an album release they might include information/metadata about who performed or wrote the piece (obviously linking to URIs to identify the person who did perform or write it, with appropriate predicates) while other bits of metadata might be more verbose: reviews of the album or the lyrics etc. and then again some might be media things (recordings of the album etc.). And of course because we’re talking about a graph of data, those documents making assertions about a thing can in turn also have metadata/data/documents which make assertions about them, for example, who wrote it, comments about it etc. Imagine what might happen if a news website took this approach? You would mint a URI for the event (or reuse one that already existed) and then write news stories about it, each with their own URL, each making assertions about that event. It would create a news service which was truly native to the Web, rather than a facsimile of the printed press. Imagine then what it would be like if we could link-up all the news stories on the web which also made assertions about that event. As a user of such a site/ set of sites I could find everything about a given thing (a person, event or place). concepts and events are still social and technological artefacts, but they are designed to help interconnect descriptions of butterflies, documents (and data) about butterflies, and people with interest or expertise relating to butterflies. In other words what matters is a way of identifying things, a way of interconnecting them and a way of describing them — subdividing those ways of describing them into ‘data’ and ‘metadata’ is unhelpful, or at the very least adds nothing useful. …if you look up William Shakespeare in a dictionary it says “English playwright, lived in the 17th century, wrote Romeo and Juliet and Hamlet, etc.” Is that what the name William Shakespeare means, and is that what the concept William Shakespeare is? That sounds plausible, but it turns out not to be true. If we were to learn that William Shakespeare didn’t write any of the plays attributed to him — let’s say that we learned he didn’t even live in Stratford, that there was a clerical error and he really lived in Warwick. He would still be William Shakespeare, and we wouldn’t posthumously dub the real author of Shakespeare’s plays William Shakespeare. We would just say we were mistaken about what we believed about William Shakespeare. So what is the concept of William Shakespeare, the meaning of the word William Shakespeare? Basically, when Mr. and Mrs. Shakespeare christened their son William, and the name stuck, and then everyone who knew him, and then who knew someone else, who knew someone else, and passed it down to us — that unbroken chain of transmission of the name from the moment of first dubbing is what gives William Shakespeare its meaning. There’s a sense in which to have a concept necessarily means to be connected to the world through this chain of transmission of a name going back to the moment of first dubbing. So while I don’t think it’s helpful to separate data from metadata it is helpful separate concept from conception.